In this holy Requiem for the Unborn, we continue our witness and worship of the God of Life. 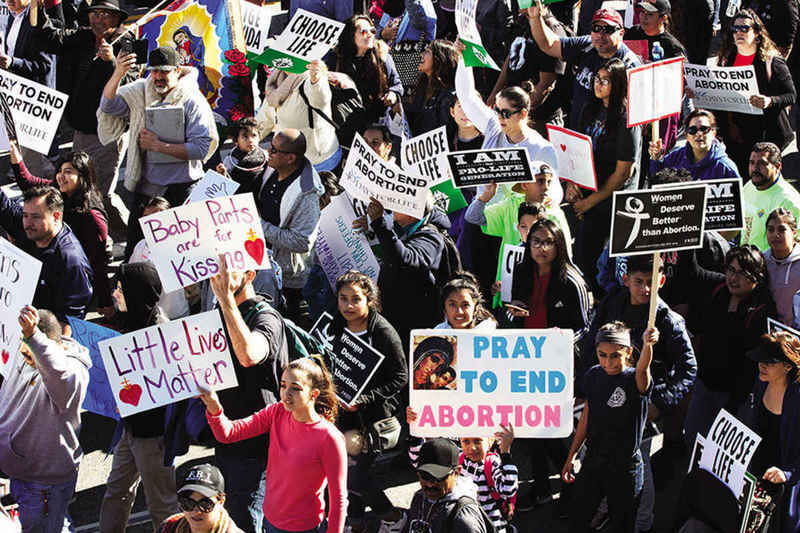 We began this “day for life” with our fourth annual OneLife LA celebration. We started with a beautiful, peaceful procession from near the city’s oldest Catholic church and we marched through the heart of the city, praying the rosary and singing. Then we had a beautiful celebration in the afternoon. Now, in this solemn Requiem for the Unborn, we remember and weep for the lives that have been lost this year. These lives that never even had the chance to be born. Nobody likes to talk about the sad reality of abortion in our society — but we must! For too long, abortion has been an “everyday evil” in this country — and indeed, in every country. And we need to make it stop. We need to build a society where abortion is unthinkable, a society that welcomes every life as a gift from God. God comes to us, now, and he gives us a message to deliver to our great city, to our country and to the men and women of our times. He calls us to proclaim the gospel of life, the good news that he is the living God, the God of all creation! We are called to announce this good news to every person: That we are made for greater things! That every human life is precious! Your life! My life! Every creature has a reason in God’s creation. And every person has a purpose under heaven. I was thinking today, as I was looking out at all the faces in the crowd at OneLife LA, and again tonight, seeing all of you. It is something amazing. Every face is different. It is a simple point. But there are no two people who are the same — in all of creation. God gave each of us a different face, different DNA, different fingerprints, even. They are little signs, but they point to something far greater, something far more amazing. God made “a decision” to make each one of us. He decided to make you and make me. That is how special we are to him. And that is why the world is a little “less” for every child that is lost through abortion. That is why we mourn tonight in this Requiem Mass. And we know that, in a certain way, God is weeping with us, just as Jesus wept when he came to the place where Lazarus laid. But our Lord told us — he promised us — that those who are mourning will be comforted. And tonight, we believe that God will wipe away every tear from every eye. But he is calling us to do our part. Jesus is calling us, too, to follow him and to be disciples for life — to carry the message of God’s love and mercy to our great city, and to the ends of the earth. The way of Jesus is the way of life! It is not the way of death. That is why we need to continue to resist abortion, and that is why we need to keep reaching out to all men and women and families in need. We are really called to take care of one another. We are called to treat others with the same mercy and compassion that we want for ourselves. If we want life for ourselves, then we need to defend life for others at every stage; we need to protect especially those who are too weak to protect themselves. Brothers and sisters, we are part of something greater. We are part of God’s plan of love, the kingdom of life that is coming into our world. And we know that one day there will be no more tears, no more weeping. One day, there will be no more need to hold this annual Requiem for the Unborn. So, let us continue to follow Jesus and proclaim his beautiful message of life to our great city and to the world! Let us ask our Blessed Mother Mary, mother of God and our mother, may she help us, all of us, to know — the greater things that we are made for, and the precious love that God has for every life, for each one of us and for every single human person.